• Custom drapery is available in any size up to 29 1/2' wide in 1/4" increments and 15' long in 1" increments. • Use a steel tape measure, measuring to the nearest 1/4" in width and to the nearest 1" in length. • Measure each window and doorway individually (note: windows and doors that appear to be the same size often are not). (i.e., rod placed directly on window trim) or wall-mounted rod (A). panels to rest when they are open. If you choose to expose your entire window: Add 3–12" to the actual width of the window to allow enough space when the curtains are completely open in order to “clear” the window. • Consider the extra wall space needed for decorative finials. • Pinch pleated, goblet and flat hook header style drapery that is hung from rings (B) requires the drapery rods to be installed at a height greater than the length of the drapery. • Drapery rings (B) are recommended for ease of opening and closing drapery panels.• Note that drapery rings add a few extra inches to your rod placement. from bottom of rod to floor, and install the rod at that height. at least 3" beyond either side of the window frame. Pocket drapery, there is some rod “take-up” when the material is gathered onto the pole. Typically, you will need to install smaller rods 1" lower than the finished length, while rods with a diameter of 2" or more will need to be installed approximately 2" lower. • Measure outside window frame to outside frame (see A). • Add 3"-12" for panels to rest on either side of window frame when open. • If not using drapery rings: Measure from bottom of rod to floor (see B). measurement to the drapery length to determine rod placement. Drapery rods are typically installed 4" above the window frame (see above center) or closer to the ceiling (see above left). • Measure the full length of your track or pole and not simply the window itself. Some tracks have a centre overlap. If so, measure it separately and add it to your end-to-end measurement. Poles, however, just need the width measuring, not taking any decorative end pieces into consideration. The measurement you take here is your total pole or track width that your curtains will be covering. We make allowances for the fullness and gather, calculated from the track or pole size entered. Measure the width of the area you would like to cover. This is your ordering width - fullness is already accounted for. Decorative, stationary drapery may be any width you like. If your drapery needs to open and close, the total coverage width will equal the total width of your hardware. We recommend extending hardware out from the edges of your window as much as 6"- 12" on each side when possible. This will help make the area look larger, and will also allow as much natural light as possible when the drapery is open. • Measure overall window width (see A). • Add 4" to 8" to reduce light gaps for privacy as desired and overlap. • Important note about fullness. 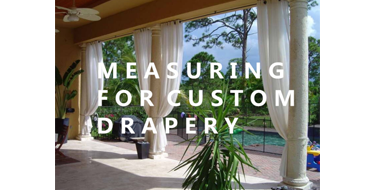 Measure the desired length of your drapery. Keep in mind the hardware type you plan to use and where it will be mounted. The finished length you supply us with is the exact measurement to which the drapery will be made. Increase the length if puddling is desired. your panel length. This is the overall panel length needed. 1" Puddle: Also called a “break” or “trouser break.” A clean look, with drapery just touching on the floor (see “Tailored” above). 2-4" Puddle: A standard puddle, with just a slight spill of fabric (see “Standard” above). 5-8" Puddle: A true puddle with enough extra length to fan the fabric out onto the floor (see “Full” above). 10"+ Puddle: Appropriate for heavy material and very lush decors. • Puddling is not recommended for drapery that will be opened and closed regularly, as the bottoms will get dirty very quickly. Our drapery length reflects the full length of fabric, from the top edge to the bottom hem. • For flat hook, pinch pleated and goblet header style, measure the length from the bottom of the installed drapery rod or drapery rings, to the floor. Subtract 1/2" to get the panel length you need. • For a pencil pleat or pinch pleat heading, measure from the top of the track or the small eye on the ring of the pole to just 1.5cm above the floor, or approximately 15-20cm below the window sill - you can use your best judgement for where you'd like your curtain drop to end. This is your finished hem to hem drop. Both headings can be adjusted when fitting using the multi pocket tape and hooks for Pencil and the pin on hook for Pinch pleat. • For longer, more formal drapes that puddle on the floor in luxurious folds: Add 1"-10" to the height measurement.